Yet, our eating and cooking habits are also “contaminated” by other cultures – especially for those who, like me, have emigrated to other countries or the presence of large communities in some countries (Indians in England). This “contamination” brings on the one hand enrichment to our own gastronomical upbringing, on the other hand it broadens our culinary horizons. 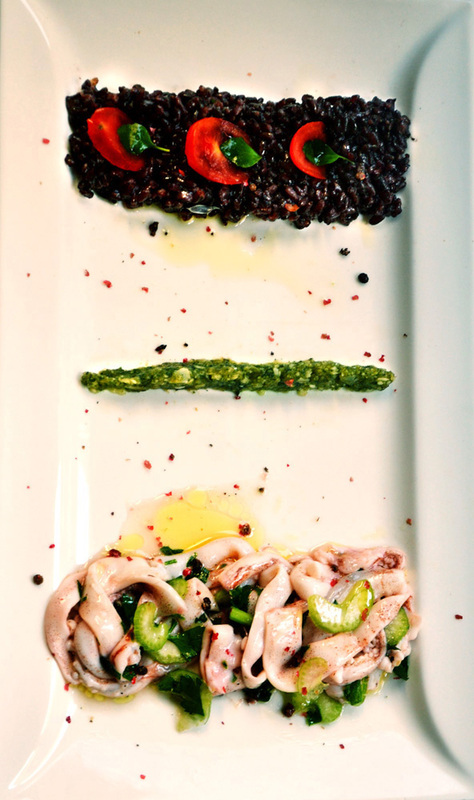 In this post I am sharing a recipe that encompasses my Latin American culinary background and the influence of Italian gastronomy…But please don’t call it fusion!!! Cut celery into fine pieces. For Almond Mint Pesto recipe, see my Pesto recipe replacing basil with mint and pine nuts with almonds. 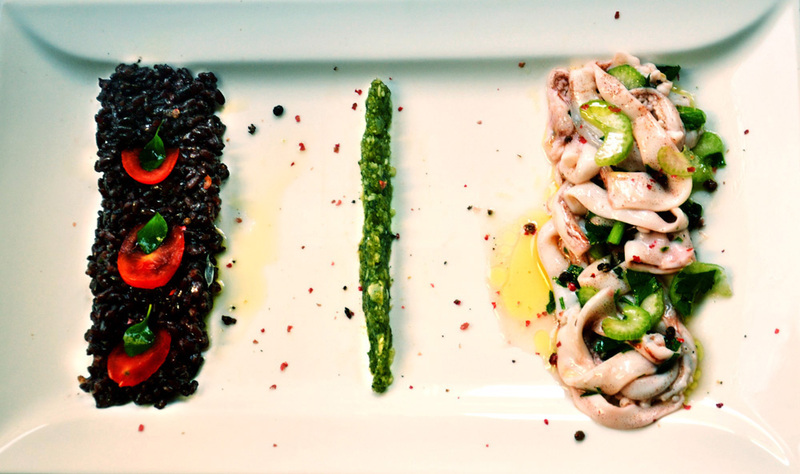 Note: Venere black rice has a beautiful aromatic ebony colored rice that marries well with seafood. It is rich in minerals and has a very delicate taste that resembles freshly baked bread. Cook rice in a pot with salted water. Venere rice usually cooks in 20 minutes. Add extra virgin olive oil and ceviche juices. GISI, TE FELICITO, LA PRESENTACION EXCELENTE, Y LAS RECETAS SE VEN DELICIOSAS!!!!!! Gracias mami! Que bueno que te gusto! Though I’m sure you have many! Thanks for the nomination! I am honored! Even though I really appreciate your kind nomination, I have decided I am not going to participate in these initiatives anymore. This does not mean I gives less importance to your award; it is just a choice I have made a long time ago. Again thanks for thinking on me and my blog! I enjoyed reading your post,I agree with you on the fact that food is indeed influenced by culture though I am not sure if I would call new influences “contamination” . Hi Sawsan!! Thank you for you kind comment! The word contamination was intended to be a provocative word that I used as an alternative way to describe the elements that are absorbed into (or that alter) a country’s gastronomy in a positive way. A wonderful, thought-provoking post, Ambrosiana. I gained a new respect for my Mom’s cooking during my first trip to Italy. My Grandmother had been ill for much of Mom and Zia’s childhood. They learned to cook from neighbors and family friends. It wasn’t until I travelled did I realize how “true” their cooking was. At one point, I remember remarking to my friends that it was as if Mom was working in the kitchen. That trip sure was an eye-opener for me. Hi John! Thanks!! I think travelling opens up your mind and also makes you appreciate more where you come from! As far as eating this dish, I would blend all ingredients together and then it the whole thing! I find that the blending of different cultures foods and traditions have expanded my love for food! I too had only Italian growing up so when I became an adult and open to this wide world of food, I wanted to try it all! I love this dish and presentation. The blending of flavors sounds perfect to me! Thank you!! Indeed coming from different cultures does open our minds and thus enriches our culinary expertise!! Delicious recipes, looking great. I’ve given up worrying about how food is “plated” – all I’m interested in is how it works on my palate. You just know how to make things taste wonderful. Lovely post with sane sentiments that work for me. Thanks Roger!! It is important that food tastes better than its appearance. Nothing is worse than fake looking food that tastes bland!! Whatever you call it, I call it delicious! And I love this crossing over and mixing up of cultures (well, I wouldn´t have been born for a start, and then I wouldn´t be with Big Man) and all the richness of food, cluture, tradition we gain from it 🙂 Buon Anno! Grazie Chica!! Buon Anno anche a te!! An interesting post and a beautifully plated meal. Have a healthy and happy New Year! I look forward to more delicious recipes in the future. Thank you Karen! You are so sweet!! Happy New Year! Hi Dakota!! let me know when you are going to be in Roma! I’ll be glad to meet you!! So true! I believe food is a culture of it’s own, too, and not just a reflection of our cultures. The dish looks very classy, something I might not even want to bite into and ruin 😉 must be a delicious fusion of cultures and flavours!